Create a new, SEO-friendly website for this New Jersey based security company. We designed a full-width site with large, inviting photography, custom icons and text callouts that add user-friendly appeal. The homepage includes testimonials, a slideshow that shows off their services and buttons that link to the home or commercial security areas of the site. To maintain a consistent look, we redesigned their existing graphics and charts. This project included high level content editing, and keyword research for SEO. Designed in WordPress, the site is easy for the client to edit. 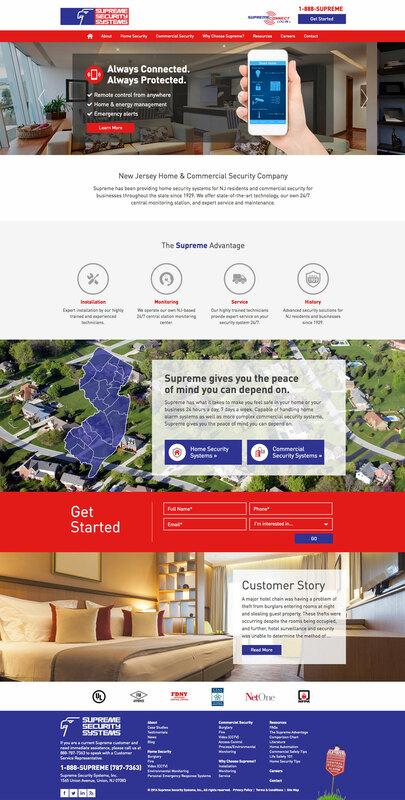 Supreme can log in and add articles, testimonials and more as needed.